You might say they loved till their dying breath. And left everyone else to pick up the pieces. Roy Lichtenstein it’s not, but it is the 25 foot tall statue commemorating the iconic photograph of the “Times Square Kiss” taken by Alfred Eisenstaedt. The statue is being moved from the San Diego waterfront to somewhere in New Jersey. Not to worry, however, as the LA Times has reported that $1,000,000 was raised in eight weeks to purchase a replacement. So one version of the iconic image is being dismembered, but only temporarily, and the result will be two versions instead of none. Iconic reproduction continues even when it appears that the image is being dismantled. But can you really dismember an iconic image? Doesn’t an icon have a unique singularity, such that you always get the whole instead of a part? Isn’t it an icon because it has resisted the forces of fragmentation and dispersion that are constantly at work in the media environment? Well, actually, sometimes icons are broken up into their parts, whether as citations of the whole work or for other reasons as well. It’s only because the statue is gargantuan, urethane, and imitating human bodily form that this dismemberment is unsettling enough to merit a news photograph. What is interesting, however, is that the piece in the foreground contains all the features that distinguish this particular icon. Compare it with the two pieces in the background (one is largely obscured) and you’ll see what I mean: the kiss itself, their postures, and their hands tell most of the story. The rest is all uniform–which, like their actual uniforms, provides the background against with the figural distinction occurs. Once again, by breaking up the image, the image is reconstituted anew. Or not. For there is another sense in which the image is being dismembered or, more precisely, disremembered. The caption at the Washington Post slide show yesterday included this description: “The statue of two Navy sweethearts kissing.” Much as I’d like to think otherwise about the major paper in Washington DC–but why am I not surprised?–it seems that the editor knew nothing about the original photograph. The sailor and nurse in that photo were not sweethearts, but rather completely anonymous to one another, and she was not in the Navy. Instead of historical veracity, the statue has been recontextualized in terms of its location beside the USS Midway museum in San Diego. Many spectators along the waterfront may have seen it much the same way, and so the icon had already been dismembered, taken out of context, made a part of another time and place. 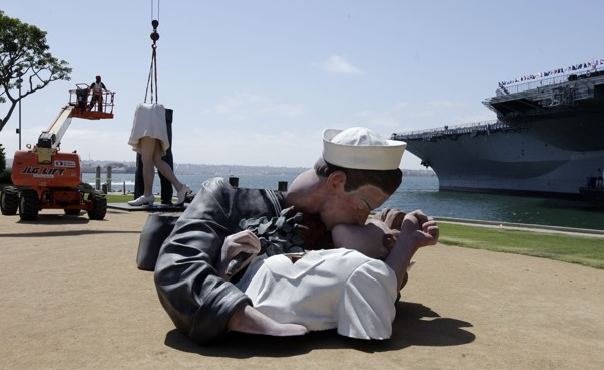 A similar transformation applies to the title”Unconditional Surrender,” which had been supplied by the sculptor, Seward Johnson, and also referenced by the Post. While it could still refer to the surrender of Japan in August 1945, for many today it will refer only to a fantasy of romantic love. This wholly privatized meaning can get by even though the hands of both the sailor and the nurse, faithfully reproduced to adhere to the iconic template, make it pretty clear that restraint was still somewhat the order of the day. But that was then. Today, iconic images are as solid as ever, which is to say: more than most, but less than you might think. Photograph by Gregory Bull/Associated Press.